Xeriscape (zer-i-skape) is a word originally coined in Colorado to describe landscaping with water conservation as a major objective. The derivation of the word is from the Greek "xeros," meaning dry, and landscape -- thus, xeriscape. 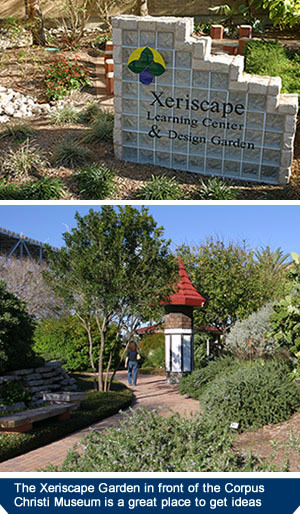 Xeriscape is creative landscaping - a different way of looking at your yard with an eye on saving water. It does not mean you have to cover the property with rocks, cactus and paving. Xeriscape is still green. You can make it downright beautiful. And it still requires a good deal of water to supplement the reality of inconsistent rainfall in warm, windy, semi-arid coastal South Texas. It also has the benefit of lower maintenance requirements with reduced lawn mowing and fewer weeds to contend with. Xeriscape has become an international concept as communities encourage wise use of water to extend water supplies. About half the water used by an average household in the Coastal Bend annually goes toward watering the grass and plantings. Some thoughtful Xeriscape and good irrigation practices can result in a 30% to 50% reduction in water consumption for landscape maintenance. PLANNING - Whether you want to redesign an old landscape or start fresh, you'll have more success with a plan. Think about how your yard is oriented to the afternoon sun and the prevailing southeast wind. Constant wind plus high temperatures can kill new plants in a hurry. Be careful about using gravel and paving on the south and west exposures where it can raise temperatures. Think about how your family uses the yard. GRASS - One of the most misunderstood aspects of xeriscape is the appropriate use of turf grass. Grass lawns are easy to maintain, provide play surfaces, have a cooling effect, prevent glare and reduce erosion. Some grass areas are a sensible part of a landscape plan. Consider avoiding narrow strips of turf like islands which are difficult to water without wasting a lot of water on the paving and sidewalks. PREPARE SOIL - Proper soil preparation is the key to successful water conservation. The best opportunity to do this is before a landscape is put in. Add organic matter to the soil before you plant grass - it is your best chance to have soil that will encourage deep roots and reduce water demand. Add organic material annually to garden areas. Plant roots need air to thrive and organic material will help loosen the soil. APPROPRIATE PLANTS - Try to select trees, shrubs and ground covers which require little or no supplemental irrigation after they are fully established. Look for plants that are tough and consider natives and plants adapted to the Coastal Bend climate. One of the most common mistakes in plant selection and location is not allowing adequate room for the mature height and width of plants. The Aransas/San Patricio Master Gardener Association, in cooperation with the Texas AgriLife Extension Service and the Water District, has produced a helpful plant selection guide targeted at the coastal environment of these two counties and Mustang Island. USE MULCH - Mulch provides a cover over the soil, reducing evaporation, soil temperature and erosion. It also limits weed growth and competition for water and nutrients. And as organic mulch decomposes over time it improves the soil structure. The Master Gardeners recommend a 4-inch layer of mulch that can make the difference between gardening success and failure. They also promote compost because it acts as fertilizer, mulch and soil conditioner all in one. It helps sandy soil retain water, loosens clay soil so water can percolate, and provides nutrients and air needed for healthy roots. WATER WISELY - Whether you are moving sprinklers, pouring from watering cans or have an automatic system, irrigation is an integral part of common-sense landscape planning. Most people water lawns and flower beds too much and too often. Avoid frequent, shallow sprinkling. A one-inch soaking once a week is about right and will promote deep root growth. A landscape plan that groups low water demand plantings together is more efficient. North and east exposures need less water than south and west exposures. Consider a drip system for outlying shrub orders and raised planters, around trees and shrubs, and in narrow strips. MAINTENANCE - Any garden will require some maintenance such as pruning, removal of trash, occasional weeding, pest management and monitoring of irrigation. As a general rule it is best to remove no more than one-third of the grass leaf blade when moving. This will help conserve water and energy. Less nitrogen fertilizer is appropriate for low-maintenance lawns. Two applications per year of slow-release nitrogen fertilizer, one in spring and one in fall, are considered sufficient in coastal South Texas.